LED Tealight Candles with Remote - Set of 12 from Collections Etc. $14.99 $12.99 Save up to 13% Now! Handy LED tealight candles can be used for a variety of lighting and decorative needs and are especially convenient to use because they can be controlled with the included remote control. 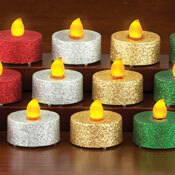 Set includes 12 warm yellow, flickering tealights or 12 color-changing tealights. Each tealight includes 1 button cell battery. Remote control also includes a button cell battery. Plastic. 1 1/2"Dia. x 1 1/4"H. Color available in Color-Changing or Yellow. (This item can only be shipped to the 48 contiguous United States – no expedited shipping). New to me and very unusual. I would buy these candles again. I would buy these tea lights agaon. I like looking at your magazine and looking for things to buy. - no nickname, Tenn. I would buy this procuct again. I probably wouldn't buy again. Poor Products....doesn't "Lite up my life"
I wold not bye again. Went through two sets of battery in two days. Remote shuts them off but they keep draining overnight. - Laura, Longview, Wa . 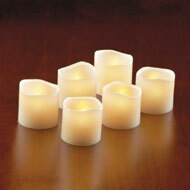 Set includes six cream-colored LED votive candles. On/off switch. Each includes a button cell battery. Paraffin and plastic. Each measures 2"Dia. x 2"H. (This item can only be shipped to the 48 contiguous United States) and cannot ship expedited. 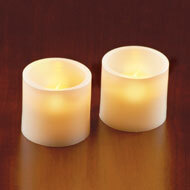 Set includes two cream-colored pillar LED candles. On/off switch. 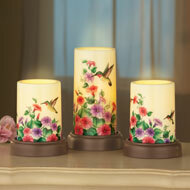 Each 3" x 3" candle requires 3 "AAA" batteries (sold separately). Paraffin and plastic. Candles are 3"Dia. x 3"H.
LED lights inside provide a warm glow without an open flame. Each req. 2 "AA" batteries (sold separately). Plastic and resin. Each candle is 3 3/4"Dia. Two smaller candles are 5"H, and center candle is 7"H.